Always Think Bigger: Tooth fairy: Do you still believe? It makes me sad to think that I have already reached the point where my daughter doesn't always feel comfortable talking to me and would rather write to the tooth fairy. 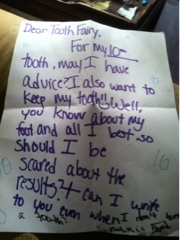 But part of me is also warmed by the fact that my 11 year old still believes in the tooth fairy. It's kind of awesome that I've managed to keep her "in" her childhood this long. So much is changing so fast for her, I'm nervous about what the future holds for us. Why is raising a preteen so hard?